I thought my success the first time round was mostly down to beginners luck, but it's actually the pattern that makes life easy for you. 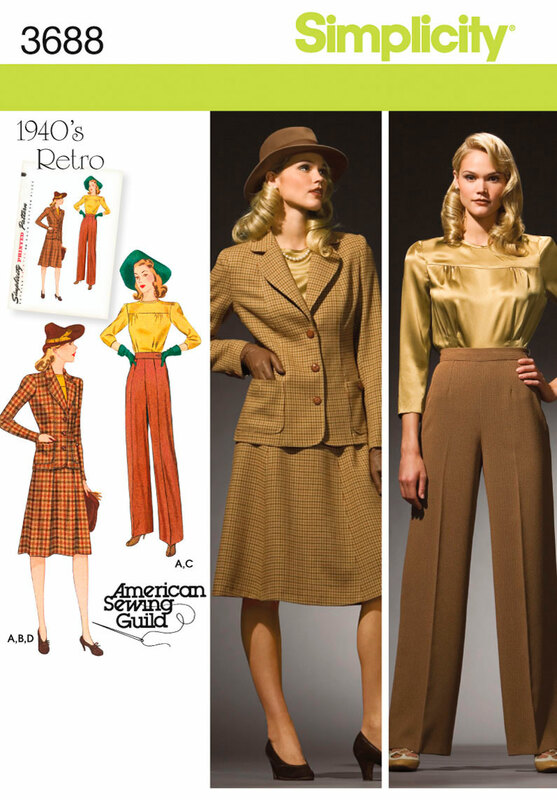 The pattern is based on a 1940's design, with a high, darted waist and wide legs. The only slight niggle I have with the pattern is that the high waist is quite unforgiving on the stomach area. So unless you've got a washboard stomach, be sure to wear industrial strength undergarments if you don't want your stomach to look bigger than it actually is. I got to use my Margaret Howell 'trousering' at long last, but only just managed to squeeze the pattern pieces out of the 1.5 metres I had. The fabric is lovely and drapey and perfect for this style. Alas though, I think it's actually a linen/cotton blend, which makes it great for summer wear, but totally useless for snowy England. Snowy weather + not much natural light = gloomy looking photographs. Sorry about that. The trousers do look a bit grey and drab in these photos, but I've got high hopes for them in the summer teamed with my beloved red wedges and a crisp, white shirt. Thank you so much to everybody who entered the giveaway to guess the name of my dummy. It was fascinating reading your guesses. For a start, I had no idea there were so many names that began with an A! Secondly, most readers tend to associate a dummy with an old-fashioned name - Annabel was by far the most popular, followed by Agatha, Audrey and Alice. Unfortunately, the dummy's name isn't of the old-fashioned variety. Scruffy Badger was thinking along the right lines when she tried to get into my 1970's/1980's cultural mindset. Sadly, even though the names she came up with were awesome, the dummy's name wasn't amongst them. Get to the point Jane, what's the bloody name??!! Well, the truth is NOBODY guessed the actual name of my dummy! If I was Rumpelstiltskin, I'd be a doing a little dance of glee in my striped tights at this point, because the name of the dummy is…… ANGIE. Don't ask me why because I have absolutely no idea. Angie is a fine name though and she's in good company…. Remember Police Woman from the 1970's? No? Maybe I was the only one who watched it. David Bowie's first wife had her own very distinctive style. And finally the wonderful Angie Watts. The Queen Vic's original and best landlady. If somebody asked me what Angie was short for I'd say Angela. So although nobody actually guessed Angie, one reader guessed Angela, so hoorah for Sarah Shewring who gets the turquoise knit fabric. There were a further handful of entries that included Angelina, Angeline, Angel and Angelique so I think it's only fair that one from that group receives the second prize. 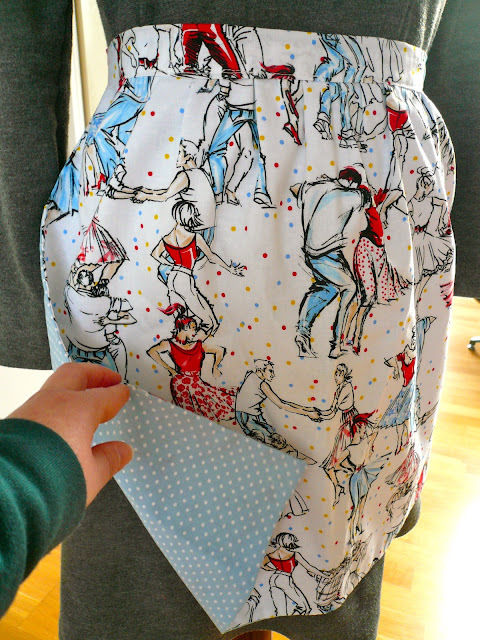 The randomly chosen winner is Jacq C who went for Angelina and receives a jiving 1950's style half apron. If you could email me your addresses ladies, I'll get your prizes out to you. Thank you again to everybody who entered and took the trouble to comment. I love conversations about names so I had a lot of fun reading your comments. I'm definitely going to do something similar for my next giveaway. Brrrr. IT'S FREEZING!! Because the weather's so cold, I thought I'd hold a winter warmer giveaway to warm at least one of you up. I'm giving away the rest of the turquoise sweater knit fabric that I used for my raglan sleeved dress. There's about 1.8 metres in total, but one end does have a chunk cut out of it so I'd say there's about 1.5 metres of usable fabric. That's still a decent amount to play with as it's wide (60 inches). You could make a cosy knit dress, or a Renfrew or a nice woolly skirt, and most importantly you'd be warm! This is not a simple 'leave a comment' giveaway though. Oh no. This time, just for fun, I'm going to turn into Ealing's answer to Rumpelstiltskin and ask if you can guess the name of my dummy. 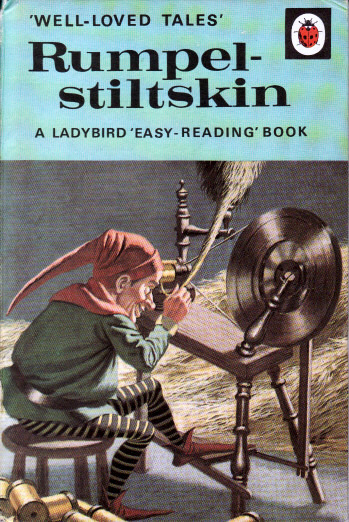 Who else loved Ladybird books when they were little? I deliberately didn't give my dummy a name when I bought it as it didn't really look like anything in particular, it was just a dummy (it's a standard Lady Valet by the way). Over the years however, one particular name kept popping into my head whenever I used her/it and wouldn't really go away. There's absolutely no story behind the name, it just appeared one day and seemed to suit her. But the big question is, what name is it? To narrow it down a bit (otherwise we could be here for years) I'll give you one clue: the name begins with the letter A. There, aren't I lovely?! In fact I'm so lovely, I've decided to throw in a second prize, which is a delightful 50's-style half apron made by my own fair hands. It has an awesome dancing print on the front and contrast blue polka dots on the reverse. Perfect to wear when you're cooking all that warming winter soup. Mmmmm soup. Before you ask, no, that's not a pigs trotter holding the fabric. It is in fact my porky little hand! 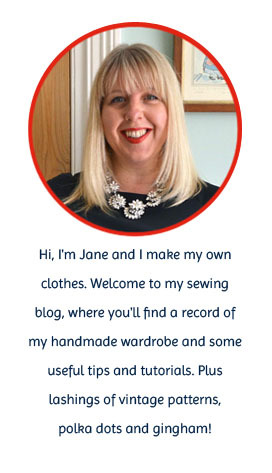 Top of my sewing plans for 2013 was to sew more knit dresses to wear during the colder months here in the UK. The reason was partly to keep my Peony-esque dress company and partly to prevent it from falling apart from overuse. I have two Maria Denmark knit dress patterns that were perfect candidates, and as I'd never used her patterns before, I went with the more simple of the two - the 2007 Kjole raglan sleeved dress. Onion is the name of the company but I'm not sure what a Snitmonster is, any ideas? I made the basic, long-armed version, without the bias panel at the bottom and it was pretty simple to put together: front piece, back piece, sleeves, neck binding. It was my first time sewing raglan sleeves but they were easy once I'd figured out how they fitted to the front and back pieces.The actual dress could hardly have taken more than half an hour to sew up. Add another half hour for adding the neckline binding and hemming and you have a dress in an hour. Hoorah, exactly what I was after. I used a £3.50 a metre turquoise sweater knit fabric from the Goldhawk Road that actually looks like it's knitted. I got carried away and bought 3m but barely used half of it to make this dress. I'm quite tempted to make a knit top with the rest and pretend I knitted it… The fabric is almost certainly a polyester blend (I've heard some suspicious crackling going on) so I'm not expecting it to keep its shape and look good for years, but if it lasts this year I'll be happy as I intend to get some serious wear out of it. I made a size 40, which is a size larger than I'd choose in a woven fabric, but I was worried about unsightly bulges showing through as the dress is a straight up and down style. It was a bit too big though, and not very flattering. After mulling the problem over for a whole minute, I simply sliced off about 1cm from each side and arm seam. The difference was dramatic, the dress was now fitted and about a trillion times more flattering. The moral of the story: sew the size that corresponds with your measurements instead of trying to be clever. It's no secret that I have a weak spot for glamorous frillies, particular those with a vintage look to them. 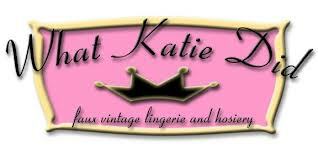 Way back in the day, I wrote this post, in which I shared my discovery of faux vintage underwear specialist What Katie Did. Well, since then I've paid several more visits to the shop, in fact I pay a visit every time I go to the Portobello Road. I try not to, as it's an absolute certainty that once I enter the shop I'm not going to come out empty handed, but still I'm drawn like a moth to a flame.